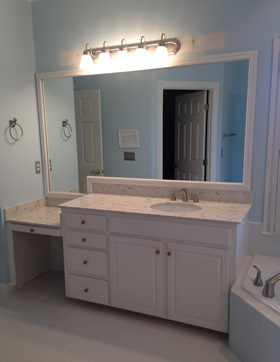 We can provide custom mirrors to fit your exact specifications. Whether you need a beveled mirror, a plain mirror or antique mirror we can supply and install exactly what you need. 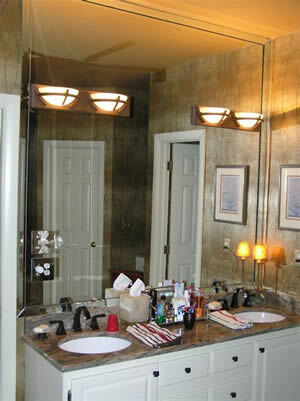 Even if you are installing a mirror that needs a special cutout for lighting we can take care of it for you. Below are some of the custom mirrors we have done. We stock many sizes of 1/8" and 1/4" mirror as well as 1/4" antique mirror. We also straight line bevel from 1/2" to 1 1/4" in our shop so that helps us get our customers what they need in a timely manner. 2" Mirrored bevel strips add a great look to a mirror when you are wanting a framed look without a wood frame. Installing a larger mirror helps to open up a small space. We can also drill holes for lights and electrical outlets, as shown. Antique mirror is becoming more and more popular. We can do a full wall in piecies or separate it and do mirrored squares. A bathroom mirror often has a light above it. 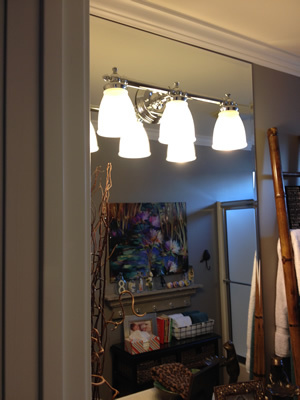 Here the mirror was cutout to accommodate the light fixture. We are now offering a way to spurce up an old/exiting mirror by adding a simple stickon "Easy Frame" wood frame. 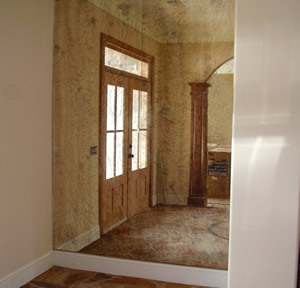 Or, you can upgrade your mirror to a custom framed mirror, custom built to any size and professionally hung. Visit the manufacturer's web site www.precisionframeworks.com to see samples. You can also visit our showroom to see samples in person. This is a Great and Affordable Option!